Work on prepositions with a fun spring theme! 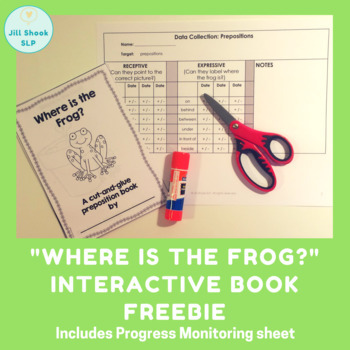 This FREEBIE includes a black and white book and a data collection sheet for progress monitoring! Great for working on expressive or receptive prepositions! ✿ Black and White Frog Prepositions book These are great for sending home. Work on language and fine motor skills at the same time while answering questions and cutting and pasting the frog! ✿ Data collection page: prepositions . Collect data for receptive and/or expressive understanding/use of prepositions. Visit my blog for activities, giveaways, and tips! • Beside each purchase you'll see a Provide Feedback button. Click it and you will be taken to a page where you can give a quick rating and leave a short comment for the product. Each time you give feedback, TPT gives you credits that you use toward future purchases. I value your feedback greatly as it helps me determine which products are most valuable for your therapy so I can create more for you!